We had no plans for today, having canceled our scheduled tour because we were all recovering from the mysterious illness we picked up at Southern Ocean Lodge. We had no alarm set, so we slept late and went down to Pier One’s lobby for breakfast at some time after 8:00 AM. Greg and Genene felt pretty normal, but I still felt tired and weak. I managed to eat some fruit and muesli, while Greg and Genene polished off big breakfasts. Genene had her Earl Grey and Greg drank “long black.” As soon as breakfast (or brekkie as the Aussies call it) was finished, I felt bone tired. I went back upstairs, climbed back into bed and slept until lunch! I was equal parts exhausted from illness and from the embarrassing spectacle on Qantas the night before. (I can never live down the shame of it!) I think Greg and Genene slept some too, and when they were not asleep, they read quietly or listened to music in our room. I woke up just before lunch and felt better. I was hungry, which I took as a good sign. We walked to the 8th pier and had lunch at an Italian restaurant. We picked Italian because I figured they would have some good “comfort” food: pastas, bread, and so on. The 8th pier is near the theatre district, and we enjoyed watching the diners who were trying to make the 2:00 PM show. We also saw a wedding party having lunch after having their photos taken on the pier. I am not sure if we were witnessing the after-wedding party or just the after-wedding-photographs party. No matter. Everyone was feeling jovial, and we perked up a little just watching the sights. We strolled slowly back to our hotel, and Genene hunted for Pokemon along the way. Before we left the states, we bought her a small international data package for her phone and for ours. We had admonished her to keep track of how much data she was using so she would not go over the limit. I guess our lecture must have scared her, because she had been so judicious (stingy) with it that she had data to burn. We leave Australia on Monday, and there was no way she could use all the data she had saved up. Pokémon helped her out a little with that problem! I think she caught some creatures that you cannot find in the US, although I don’t know too much about the game. We spent some time relaxing at the hotel. With no place to go and nothing to do, we just laid around and read books and listened to music. By about 4 PM, we all felt good enough to head out for the weekend market in the Rocks. We had been there at the beginning of our vacation two weeks ago, but we hadn’t bought anything. We figured there would be plenty of time for souvenir shopping, but we had not managed to do any along the way. There were also a few areas of the market that Genene had not seen due to the great schnitzel/shitznel incident of two weeks ago. (I can’t laugh since I am now the vomit queen of Qantas.). We ambled along and enjoyed the ambiance of the market. We even found some artwork to buy and headed back to the hotel for a little break before dinner. Along the way, Greg asked us to make a detour. 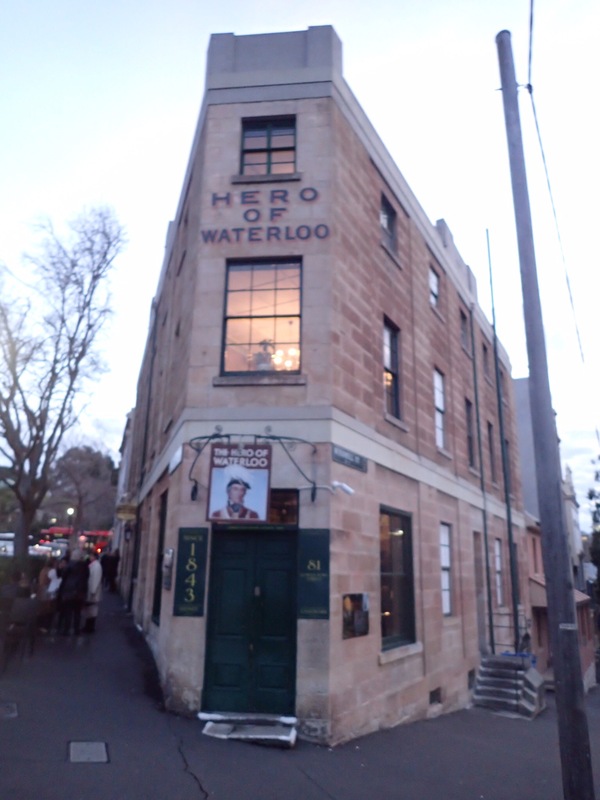 When Ormsome Orm gave us our tour of Sydney nearly two weeks ago, he mentioned that there are several pubs that lay claim to being the oldest in Sydney. Orm pointed out the Hero of Waterloo as one of the contenders. You may remember the story of the trapdoor at its bar that was used to involuntarily conscript sailors on leave. We wanted to say we had pulled a pint there, so we wandered around the Rocks until we found it! We made sure that it was okay to bring Genene inside and were assured it was no problem. It was warm and crowded inside. Genene drank a coke while Greg and I had a draught beer. We couldn’t see a trap door anywhere, and the bartender smiled mischievously when we asked about it. I guess Greg and I are too old to be sailors and Genene is too young. According to the pub’s website, there are still shackles on the walls in the cellar, and the entrance to the smuggler’s tunnel can still be seen. We were not allowed to go down there, so I can’t vouch for that. I can vouch for the fact that they pull a good pint. We headed back to our hotel. I was happy to be feeling better. We had arranged to have a special guest star for dinner. Our friend Polo Baran (brother to the beautiful Mariana Baran Goodall and brother-in-law to my law partner “hot mess” Taylor Goodall) is living in Sydney. He is in graduate school for business, and we had made contact with him through Facebook and invited him to dinner with us. It was touch and go as to whether we would be able to commit, but he was a gentleman and told us he would “hang loose” and join us if we were able. If you read my blog last year, you will recall that we met his parents in Siem Reap, Cambodia. By sheer coincidence, we were all in that city on vacation at the same time. It seemed only right that we should find Polo here in Sydney. He met us in the hotel lobby, and we formulated a game plan for dinner. The concierge recommended a Greek restaurant, Athenian. It would require transportation, and Polo introduced us to the wonderful world of Uber in Sydney. We use Uber all the time in Houston, but it never really occurred to me that it would be available in Australia. Polo whipped out his iPhone, and in a few minutes, our driver arrived to whisk us away. It felt good to be on an adventure again, even if it was just a Uber ride to dinner. 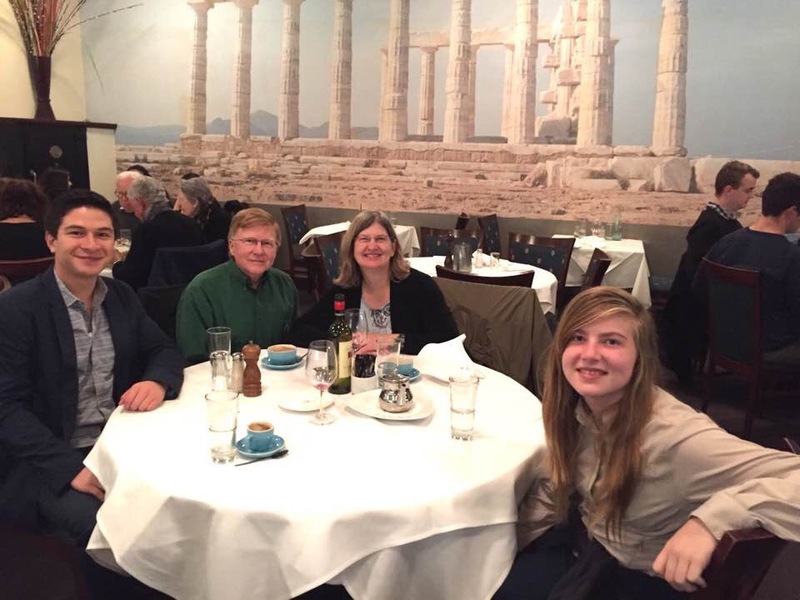 We had a wonderful evening of food, wine and travel talk at Athenian. I thought the food was pretty good, but not spectacular. My lamb dish was good but nothing to write home about. The service was excellent though, and it was fun to watch the crowd. What was really fun was to talk travel with Polo. He just returned from an epic summer journey that included going on an African safari, bungee jumping, and staying in hostels with little running water. Ah, to be young again. (What am I saying? I never did that stuff when I was young.) Polo’s dream is to start an adventure travel company in his hometown of Monterrey, Mexico. The city is known for its beauty and mountainous terrain but is not yet on the radar of adventure travelers. Polo hopes to show the city to the world. We can’t wait to be one of his customers! It felt good to be back in the groove, dining out and laughing with family and a friend we met up with on the road. We finished the meal and asked the waiter to take this shot. It was after 10 PM, and Polo had ANOTHER party to attend. (Ah, to be young again.) We bade him goodbye at the corner, and we each got into an Uber and headed out for our next adventures. Polo was ready for the next party, and we were ready for bed. We were hoping to get back on track and on our itinerary tomorrow. It would be our last full day in Australia, and we were supposed to tour the zoo and climb the Sydney Harbour Bridge. We needed our beauty sleep!